GymPact is a new iPhone app with a novel approach to making sure you work out because it hits you were it hurts the most, your pocketbook. 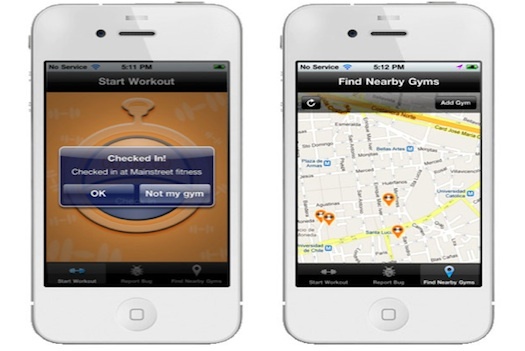 The premise of the application is simple, users pay a weekly fee to use the program, each time they go to the gym they earn money, each time they fail to check in for a full workout they lose the part of their deposit they agreed upon when creating their daily workout regime. At the end of the week money earned by the company from non-gym attending members is disbursed to people who earned cash by making their regularly scheduled workout days. For anyone thinking this is an easy system to trick the company is quick to point out that a checked-in location must remain active for 30-minutes in order for credit to be given. To sign up users must enter a valid credit card and if a routine becomes too much for you or a vacation gets in the way of your weekly credit card payment don’t worry you can just as easily go on “break” for an indefinite period of time for which you won’t be charged. A big advantage to the system? No personal trainer fees if you miss an appointment which are considerably more expensive then your GymPact payment for missed sessions.